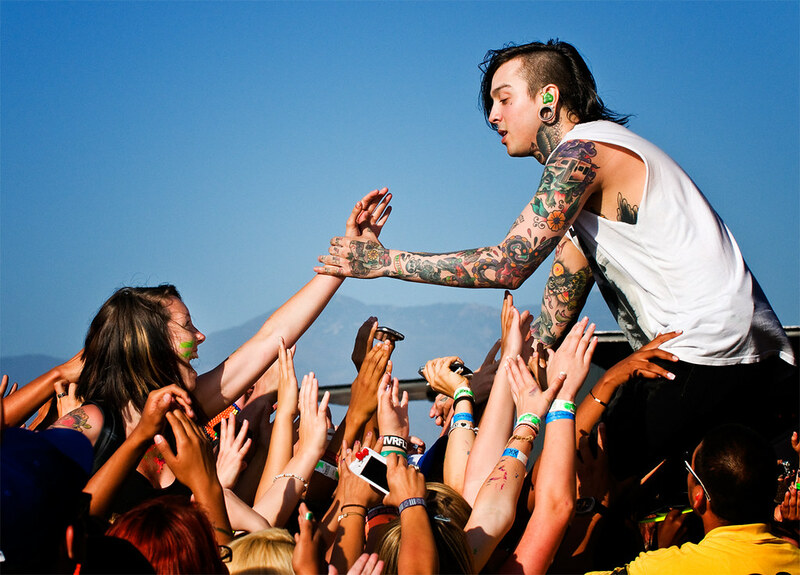 (Top) Pierce the Veil guitarist Tony Perry reaches for a fan in the crowd. 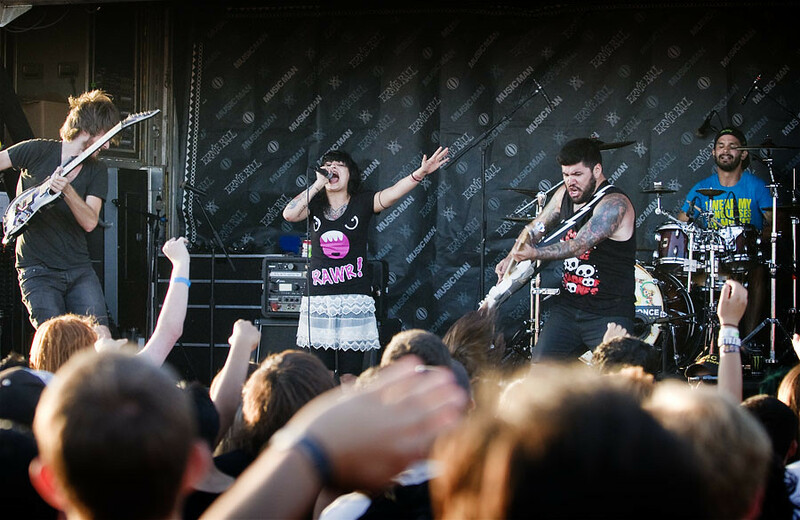 (Bottom) Fans watch iwrestedabearonce at the Ernie Ball Stage. Attention all aspiring musicians and music fans: Is it going to be the end of the world this year or the beginning of the next generation of sound? 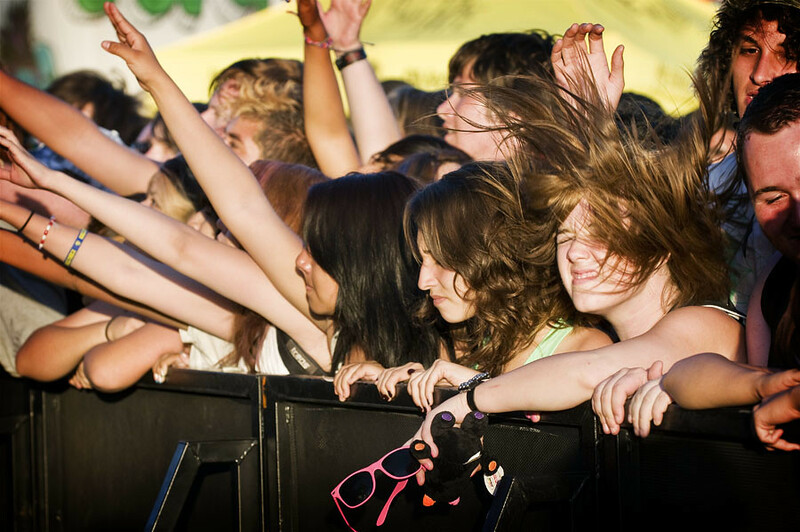 Vans Warped Tour 2012 explodes on the scene this year as though the big bang is all about fresh starts. 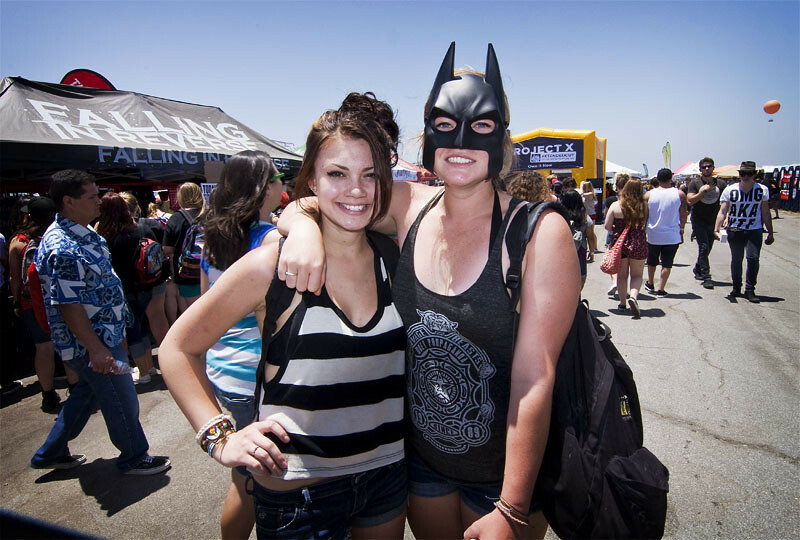 A day at Warped Tour is like fan appreciation day and a musician’s career day all rock and rolled into one. For the ever consuming fan experience, a plethora of awe amazing live performances on multiple stages is the obvious, but throughout the venue there are the other lesser known attractions to seek-out, for both avid fans and aspiring musicians. Yes, it looks like many promotional name drops to come, but don’t forget to pick-up and experience their free offerings. Kia Soul Lounge will host autograph and acoustic sessions with bands such as Taking Back Sunday and All Time Low. That’s amore music, much more, but also add here body-painting, spots to Create Your Own Beat, and play Find Your Tribe to win backstage passes. Or, you might just walk out of the lounge with VIP passes to access those KIA private risers, full shade, near the main stages. All free with only luck required to win. Bandhappy Music Lesson Tent. This is the new add, must attend for aspiring musicians, and to get lessons from actual band members. Yes, members of Yellowcard, The Streetlight Manifesto, iwrestledabearonce, and others will be giving real lessons! Wow WTF! Learn from these professionals on anything from instruments, vocal lessons, to music industry related stuff about songwriting, marketing, image, management, and gear. Many informative insights, no classroom pop quizzes or tests afterwards. It is not free, like $30 for 30 minutes. A sign shows all the band members involved and the specific instrument lesson they give. However, for free, there will be a master class meet and greet, if you want to drop a curious look-see. Ernie Ball Stage and tent will be hosting unsigned bands. This is the start before hitting it big, or before hitting it bigger on another Warped Tour stage. 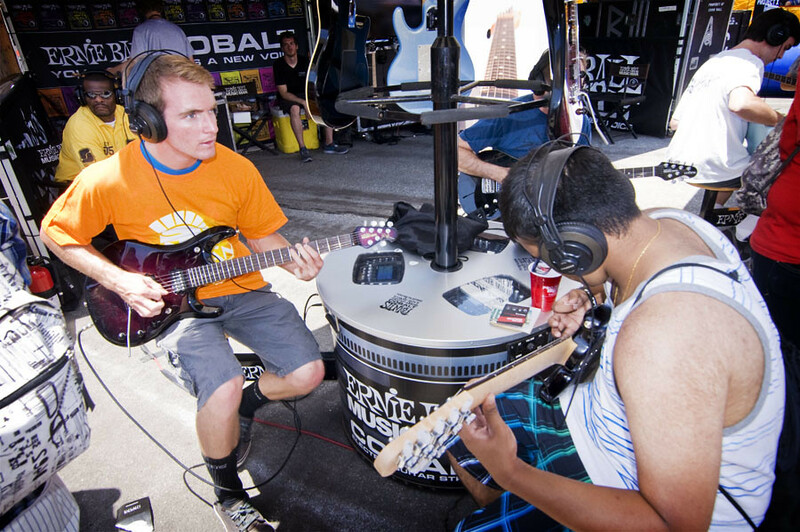 Ernie Ball hosts Battle of the Bands each year. Get to the tent, get more information on the sign-up if you think you’re good enough, and your band might be on tour with Warped Tour, this year, this tour! The deadline is two weeks prior to the tour date your band is entering to play. If you are just a fan, become a judge. If you just want fun in the tent, there will be giveaways, autograph signings, or learn some chords using a real guitar plugged into the video game, Rocksmith. Acoustic Basement presented by Full Sail University will also have performances by Ernie Ball Battle of the Bands contest winners. Each city will here host three of their own local singer songwriter talents, acoustic style. Hang here in the shade when it’s time to chill away from the sun. KROQ stop is the best experience for those dreaming to be on stage. They actually have a full-sized stage with instruments, including guitar, drums, and a vocal microphone. Are you ready to rock? Just ask. Get a group of friends together, pick-up the instruments, and show what you got! Show your favorite rock pose, that is, because it’s actually only props for a photo-op. Fat Kid Rules the World will have a massive semi-truck to promote their upcoming summer film. The flick is about a down luck teen that finds his path into punk rock and through life. This independent film will be recruiting to get screenings into as many theatres as possible. Tugthefatkid.com. Get on board. Promote the film. Get your city to play it in your theatre. Be a part of the team. Be a promoter. Enter here. 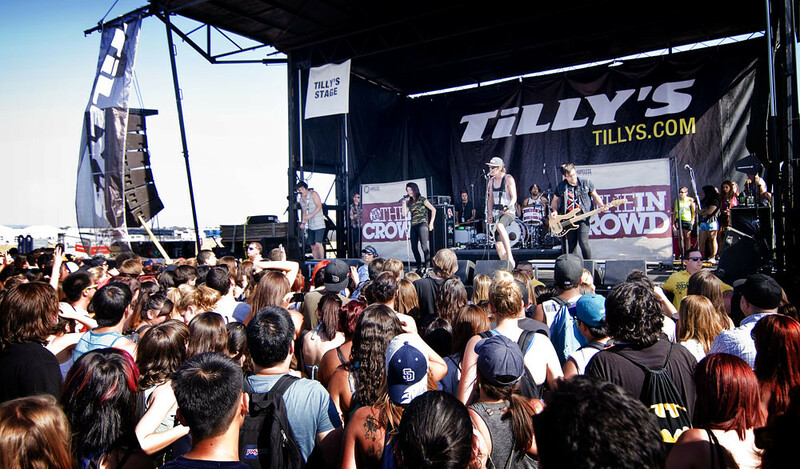 We Are The In Crowd performs at The Tilly's Stage at Vans Warped Tour in Irvine, California. 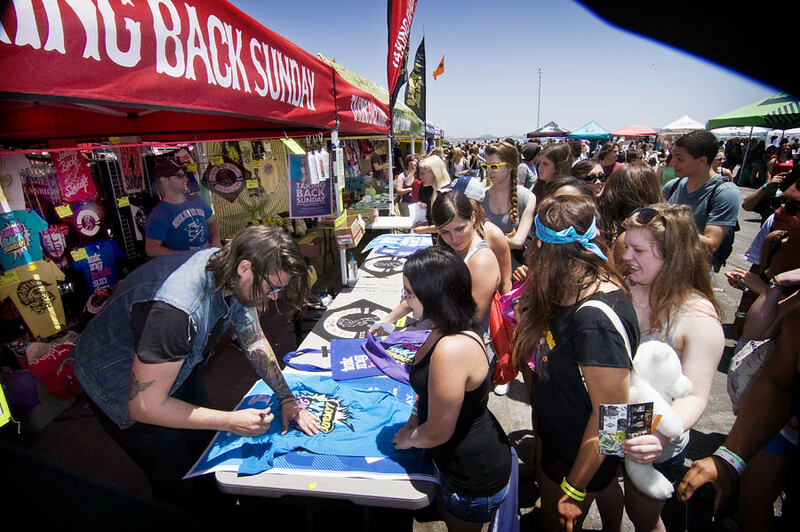 Other notable spots to hit: AP Tent and Tilly’s Booth will have daily free signings. Many other unmentioned booths will have free signings as well. American Rag booth will have an exclusive meet-and-greet with We The Kings (get there early for a wristband), free copies of Ragged Magazine “Vans Warped Tour” edition, and jump into the photo booth to show-off your style for a chance to win a $500 American Rag shopping spree. 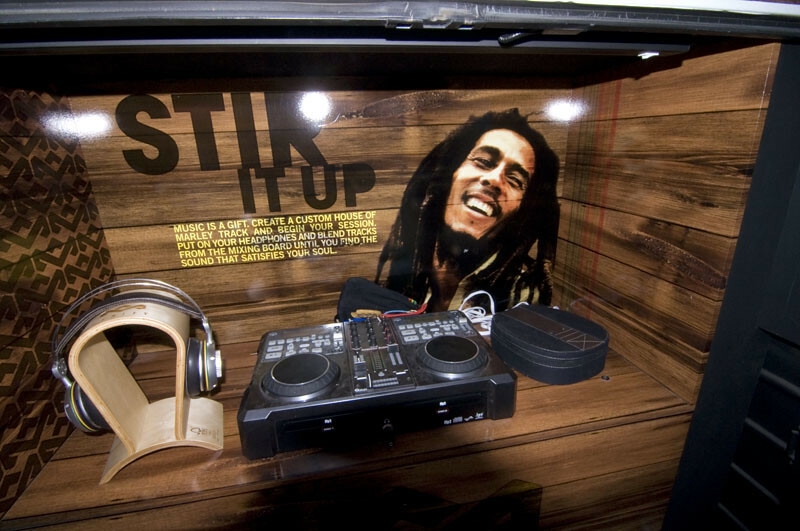 The House of Marley will host and have a fully restored Marley-inspired 1958 VW van. At the Vans Warped Tour Label Tent pick-up unfree tour merchandise like a t-shirt and this year’s tour $5 CD (or for free music from this year’s tour bands, check-out the Warped Tour website for over 30 free song downloads on iTunes). Places to hit for bodily pleasure include the Trojan Condoms Pleasure Discovery Lab. Here will find free fun and samples, enter lab to find out exactly what. Klean Kanteen will have free filtered water, kinda warm. On the other hand, checkout the Monster Energy hospitality lounge for free samples in a sports bar type atmosphere, but there is usually a slow line to get in. The fast line is at the 7-Eleven truck that will be serving up free Slupees, ice cold! Oh, and speaking of the meaning of all things Vans, don’t forget the Amateur Mini-Ramp Skate Jam. For other all things Vans Warped, find banners to click on atWARPEDTOUR.COM. (Hey! Go search to find the Vans Secret Code Word before heading early to the show. First 200 fans each day to hit the Vans Tent with the code word gets a free gift. It’s a Warped cape! Ha!) Ok. Be nice. And have a good day!